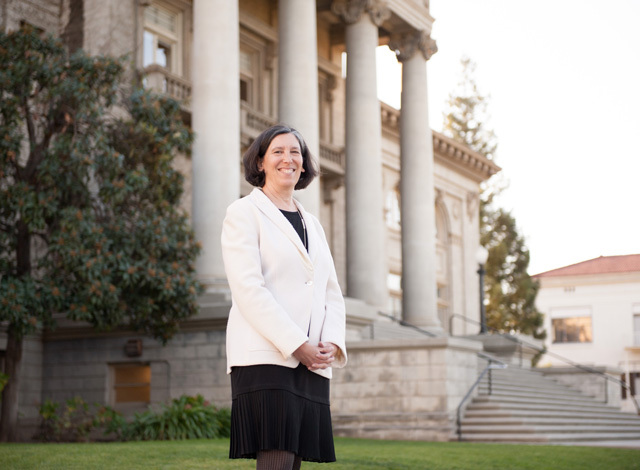 Nancy Wayne, who is professor of physiology and associate vice chancellor for research at the University of California, Los Angeles (UCLA), is spending the year at the University of Redlands as part of the American Council on Education (ACE) Fellows Program, which enables participants to immerse themselves in the study and practice of leadership. Mika Elizabeth Ono of the Bulldog Blog spoke with Wayne about her career path, the ACE program, and the surprises along the way. Mika Ono: What is your background, and how did you end up at the University of Redlands? Nancy Wayne: For the past 26 years, I've been a professor of physiology at the UCLA School of Medicine. For the past 10 years, I have also been a campus-wide administrator, including administration of lab safety oversight since 2010. I was asked to take on that role after a tragic chemistry accident that killed a young woman. The Los Angeles District Attorney filed felony charges against the professor of the laboratory, UCLA, and the UC regents. If the case had gone to court and we lost, it could have shut down the whole UC system. I was asked to step in as a liaison among the researchers, the regulatory personnel in Environmental Health and Safety, and the administrators. The job was really about changing the culture of safety. We needed to change attitudes—the scientists had to see safety as in their own interest, and members of Environmental Health and Safety had to become more service-oriented. I did a lot of work to shift those attitudes, and over time we achieved huge improvements in our culture of safety. MO: How did you get from that position at UCLA to an ACE fellow at University of Redlands? NW: I had never intended to be the safety authority at UCLA. But I found myself with a national reputation for safety administration, including a national safety award. So the ACE fellowship has been a way to expand my horizons and better align my career path with my original goals. The program, which is over 50 years old, is an unparalleled experience in learning leadership, and it combines formal programming with the opportunity to be embedded with executive leaders. MO: What have you been learning? In terms of the programming, I came together with the other 42 ACE fellows in this year’s cohort and spent four days intensively learning practical tools to be a good executive leader in higher education. For example, we learned to create a strategic plan, starting with a SWOT (for strength, weakness, opportunity, and threat) analysis. As for the embedding, I’m in the University of Redlands Office of the President, where I’m working with closely with [President] Ralph [Kuncl], who himself was an ACE fellow, Provost Kathy Ogren, Senior Vice President Cory Nomura, and the entire cabinet—which has been phenomenal. Before this, I have always been at research-intensive institutions. During the past several years, I have felt I wanted a different experience, perhaps at a liberal arts institution. Now I have been at the University of Redlands several months, I can confidently say my next move is going to be to a liberal arts institution. That's where I want to be. At the University of Redlands, I love the mission, and I love how that mission and the vision is being executed. This is a great leadership team. MO: What makes you say that? How does one evaluate a leadership team? NW: I ask whether they are working towards a common goal or fighting with each other. Some tension is necessary and healthy, but are they moving in the same direction? I see this leadership team as moving largely together and disagreements being mostly healthy. MO: Do you think there are common sets of challenges in higher education no matter where you are? NW: Absolutely. I organized a site visit for the ACE fellows to eight different institutions in Southern California —large and small, public and private, secular and religious—over three days. We met with over two dozen leaders of those schools. The common theme was concern over funding, even in wealthy institutions. But they're all making it work, and that that's where it's critical to have a strong leadership team. MO: Tell me about this other side of your career, Women Advancing Together. NW: As a scientist in a medical school, I’ve been in an environment where few women are tenured faculty. Many graduate students are women, but as you go up the pyramid there are fewer and fewer. Science is an intensive path. Especially with two children and my first husband also a medical school faculty member, it was all-consuming from the moment I got up to the moment I went to sleep. But when I became a tenured full professor, I started to look around and wonder if the biases and discrimination I felt were real. I got together with some women faculty colleagues/friends, and to have a room full of women all facing the same struggles was extremely empowering. Eventually, we developed workshops at the medical school for women in science. The workshops were very successful, and my second husband suggested I start a business and take the show on the road. Today, I provide cost effective workshops and consultations. The business has grown internationally, and it is one of the most important things I do. I blog on topics of interest to women, but everything I do for women is also useful for men. Work-life balance is something that impacts everybody, and so is negotiating for what you want. But it's important for both women and men to understand gendered influences, because we can learn from that. The feedback to Women Advancing Together has been tremendously positive. MO: Where do you see yourself going next? NW: I am still affiliated with UCLA. I'm on sabbatical, and I will be going back to UCLA for a year. It's no secret I will be on the job market. After working closely with Ralph and Kathy and the U of R cabinet, I will be looking to positions as president or provost. It depends a lot on opportunities. For both types of jobs, I bring analytical skills and the ability to develop strong working relationships. I know how to bring vision to a project, build a program from scratch into one with a national/international reputation, and be the ultimate decision maker. My experience during the ACE fellowship, including experiences at the University of Redlands, have provided a chance for me to wrap my arms around the entire enterprise. MO: What has surprised you about the University of Redlands? NW: Once I adjusted to having a board of trustees—the campuses of the UC system are structured differently—what surprised me most is how friendly Redlands is. I walk around campus and students smile at me. They look me in the eye and say, “Hello, how are you?” The culture here is one of inclusiveness, warmth, friendliness. That culture, however it is being promulgated through time and space, makes this place special, and it's one of the things I love about the University of Redlands.